May is the first month of the year that starts to bring the heat, and with not one, but two potential balmy bank holidays, it makes sense to bag an early bird summer escape! Whether you want a short haul stint in Barcelona or Turkey, or fancy going a tad further to, say, the Caribbean coast of Cancun - we've recommended the best destinations to head to if you want to know where is hot in May 2018. Better still, our last minute May holidays mean you're sure to beat the crowds to that dreamy coastline..
What’s hot: Heavenly Blue Flag beaches, electric blue waters of the Aegean Sea, quaint villages, captivating ancient sites and upbeat party towns – Crete is a great place to spend lazy sun-soaked days. Lounge on the picture-postcard Aghios Nikolaos beaches, marvel at the historical sites of Chania, or party all night in Malia. 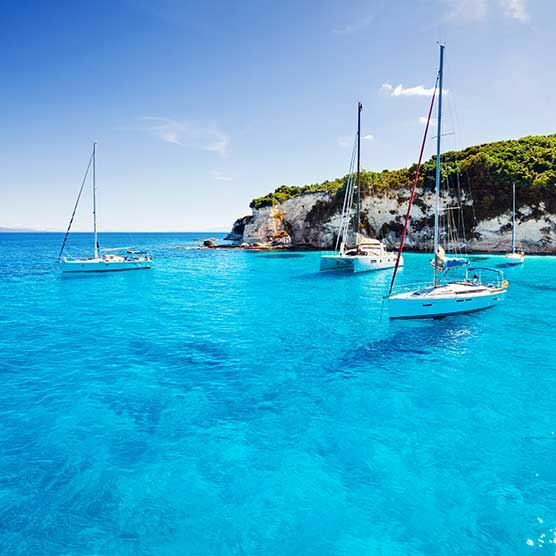 In fact, Greece holidays, whichever island you choose are a great, sunny bet for early summer. Stroll around the whitewashed houses of Santorini, explore idyllic Corfu beaches or soak in the party vibe in Rhodes. If you want to wait a little longer, why not take a look at where's hot in June instead? Mercury check: Temperatures around 24°C, Crete enjoys 9 hours of sunshine. What’s hot: Thinking about sun, sea and fun? Think Balearics. This ever-popular Spanish holiday destination has bundles of attractions for all ages – glittering waters of the Med framed by powder-soft sands, fun-loving family resorts, traditional towns, luxury spa retreats and vibrant party hotspot. While Ibiza is the party capital of Balearic islands, Majorca charms with its stunning coastline, soft white sands and exhilarating watersports while Menorca is top of the crop for chilled island vibes. Mercury check: Balearics are blessed with 12 hours of sunshine in May and temperatures in the mid 20s. What’s hot: If you’re looking for a long-haul sunshine break, nothing can beat the Mexican paradise of Cancun, boasting miles of sugar-white sands snuggling against cerulean Caribbean waters. Explore the beaches along the Hotel Zone, enjoy watersports such as snorkelling and surfing, swim with dolphins or take your kids to fun-filled Wet’n Wild waterparks. A day trip to the Mayan ruins of Chichen Itza gives a taste of the real Mexico. As the sun goes down, come back to the bustling Hotel Zone to party the night away. Mercury check: Cancun's May temperatures settle around 27°C, with 11 hours of sunshine. What’s hot: Turkey holidays are a firm favourite among sun seekers. Turkey’s golden sands feature among the world’s best beaches, so what’s better way to get that much-craved tan? Discover the famous Blue Lagoon and picturesque beaches of Olu Deniz in Dalaman, where you can build sand castles with your kids or indulge in snorkelling or diving. Antalya, also known as the Turkish Riviera, charms with exotic resorts and cosmopolitan vibe, while Marmaris is where the party begins. Mercury check: May temperatures around 24°C, with 11 hours of sunshine. What’s hot: Malta holidays offer cracking weather as early as April. Relax on the beaches of St Paul’s Bay and Mellieha Bay, dive in turquoise lagoons, explore sleepy fishing villages, or discover the historic capital of Valletta. Malta’s largest resort Bugibba has scintillating nightlife with Irish pubs, karaoke bars and club lounges. Mercury check: Average temperatures settle at 24°C in May, with 10 hours of sunshine. What’s hot: If you want the best of both worlds, try Barcelona! Tour the city by Segway, stroll through Park Guell, admire the world-famous Sagrada Familia Cathedral, treat yourself to tapas, shop at fashionable boutiques, or spend an evening at the lively La Ramblas – you’ll understand why Barcelona is one of the most popular summer city breaks. For a change of scene, hit the city’s beaches or drive down the coast to the beautiful Costa Dorada, which is home to the sun-drenched resort of Salou. Mercury check: Barcelona enjoys 8 hours of sunshine, with temperatures averaging around 23°C May. What’s hot: Aptly called the ‘Sunshine State’, Florida is one of the world’s most-loved family holiday destinations. Gorgeous beaches, city-sized shopping malls, spectacular theme parks and exhilarating watersports make Florida a must-go summer destination. Unwind on South, Cocoa or Daytona beaches, or if you’re travelling with kids in tow, enjoy a memorable day out at theme parks such as Disney World, Universal Studios, SeaWorld, Busch Gardens and Legoland. Nightlife in Florida sizzles, with a variety of restaurants and bars to enjoy, from the vibrant Ocean Drive in Miami to family friendly Orlando. Mercury check: With 10 hours of sunshine, Florida temperatures reach to an average 25°C.